You only have to look at the smiles to see that Triple-A exercise classes are about more than just physical health and wellbeing. Ryman’s activities and lifestyle coordinator Chelsea Richdale saw that for herself when she joined Weary Dunlop residents as they took part in their regular Triple-A program recently. 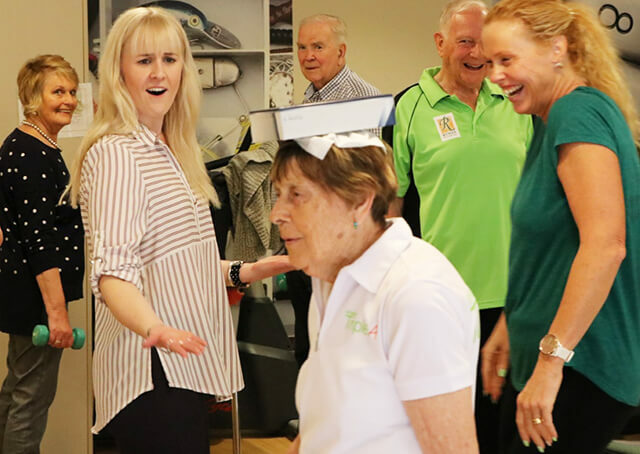 Chelsea, who is based in Christchurch, was in Melbourne to give presentations to Weary Dunlop and Nellie Melba residents on how to reduce the risk of falls. Ryman’s Triple-A (Ageless, Active, Aware) program is key to achieving that. “Triple-A is all about wellness, both emotional and physical,” Chelsea said. Chelsea said it was great to see how much Weary Dunlop residents were getting out of the classes. It was also an opportunity for her to introduce Nellie Melba residents to the Triple-A concept, and encourage them to get involved when classes begin at that village in January, 2019.